14. All Revolutions Are Not Created Equal (The American Revolution vs.
and the lecture presentations to be complete. the blessings of liberty may be preserved for themselves and their posterity. Prior to the American Revolutionary War, concerned patriots throughout the American colonies organized “committees of correspondence” to ensure that vital information about their liberty and the political state of affairs was widely distributed so that all who cared could stay informed. This lecture series has a similar focus and is part of what will be an ongoing effort to awaken again an understanding throughout America of the cause of liberty and proper government. In a modern-day setting, these lectures are intended to perform a similar function as the communications that were generated through the efforts of the committees of correspondence during the Revolutionary War. Each lecture touches upon information that is critical to the preservation of the liberty and proper government that was established at such great cost as this nation was founded. The intention of these lectures is to foster an understanding of how modern challenges that face the United States may be addressed using the wisdom and original intent of those who founded America. The words of this nation’s founders in regard to the current challenges are the core message of each lecture. The principles espoused by America’s founders are timeless, and this effort is intended to foster a return to the foundation principles upon which the United States was established so that it may again enjoy the fullness of liberty and proper government, which was created under the inspiration of God. The current state of American politics and the unremitting betrayal of foundation principles bear solemn testimony that the need for this information has not diminished, but has become even more desperate. Consequently, this lecture series and lecture book are offered as a guide that may be applied to assist in the effort to bring America back to the foundation that made it the freest, most prosperous, most respected, and happiest nation on earth. The inspired men who established this nation wrote and spoke prolifi cally. In the written record they left, they explained and defi ned in acute detail the formula for the government they created under God’s inspiration. When we return and study the Constitution “in the tradition of the Founding Fathers,” it is, in many ways, like going to the wellspring and partaking of clean, pure, sweet water, which is so thirst-quenching and satisfying. contradict the principles upon which America was founded. Consequently, there is generally a lack of understanding of many concepts that are critically important to the survival of the nation. Also, widely held beliefs often contradict the fundamentals that were defi ned and embraced as the nation was established. Each lecture could easily comprise an entire book, but by design, the series is not comprehensive in its review of each of the subjects. It is intended to briefl y and succinctly give the student a sound understanding of the issues in the words of those who established this nation. I hope it will be a resource to assist the serious student to become an ally in the battle to restore the individual God-given rights that are the foundation of true liberty. The fi nal chapter, “Our Sacred Honor,” is something of a capstone. It is designed to reiterate many of the concepts that were previously touched upon in earlier lectures and to motivate students to recognize their personal responsibility to uphold the principles and standards of liberty vouchsafed to us through the Declaration of Independence and the United States Constitution. If America is to remain free, each upcoming generation must come to know something of the bedrock principles upon which this nation was founded in order that we might enjoy the blessings of liberty that we cherish today. I hope each new generation will come to value liberty and seek diligently to preserve the principles upon which it is founded. Perhaps those who hear and read the words of the American founders will come to love these principles. This lecture series is offered to help those who will become the self-motivated leaders of the next generation, and I hope they will do the right things for the right reasons. I hope all who participate in this educational process will resolve that, from this day forward, they will hold dear the great principles upon which this nation was founded and upon which it has been preserved. Each must come to understand that the philosophy that ignores the Constitution and the framework it established or allows the plain and pure meaning of its words to be twisted and modifi ed by the whims of those who hold the reins of government debases the Constitution. Such a position ultimately removes the foundation of the nation and has the same inevitable result as though we had no constitution at all. If the words of the Constitution may mean anything we (or the Supreme Court, the president, Congress, a judge, a police offi cer, a bureaucrat, or anyone else) say they mean, or mean nothing at all, then those who hold power hold limitless power, and tyranny will surely follow. The written constitution we enjoy may be read and plainly understood by all who will take the time to study it. Great strength, stability, and confi dence may be derived by having that fi rm bedrock upon which to build and maintain our proper government. If this great nation is to be preserved, we must come to understand that those whom we select to hold offi ce are constrained to act only within the constitutional scope of their offi ce, and therefore, they are precluded from going beyond the bounds that have been set within the Constitution. If this understanding becomes widespread, perhaps then we may be confi dent that America will always be safe and free. It is from this perspective that this lecture series is delivered. 1. 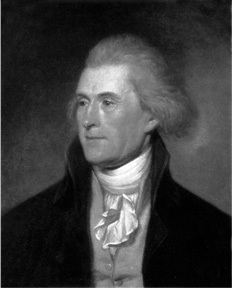 Albert Ellery Bergh, The Writings of Thomas Jefferson, vol. 10. Edited by Albert Ellery Bergh. Washington: Thomas Jefferson Memorial Association, 1907.